Composing thoughtful spaces, that reflect your individuality, personality and lifestyle. This client came to me with an unusual ask—help make an already beautiful space perfect. This freshly renovated house was a stunner, but the large kitchen and dining rooms were a touch formal and not as comfortable as the homeowner would have liked. The furniture and finishes were not exactly in step with the homeowner’s personal aesthetic or lifestyle. I helped her rework the space plan and edited out what wasn’t working. We added a mix of lighting and art plus restored vintage and custom furniture pieces to make the space beautiful and functional. I’m proud to say her kitchen is now the most used and loved living space in the house. Like many of the homes I have the privilege of designing, this Burlingame Victorian had a lot going for it from day one: great light, gracious proportions and wonderful high ceilings. With all the pluses, the style really needed an update, especially in the kitchen. A previous owner yearned for the South of France—French Country was perfect in its former life, but out of step with this young couple’s style. The lady of the house is also an artist, so I had lots of great, colorful art to use. My goal was to make the home feel fresh, youthful and appropriate for a young family. Mission accomplished. A 1990s to-the-studs remodel left this Victorian stripped of its original details and feeling dated. The homeowners, a young modernist couple, wanted a home that reflected their look and served the needs of their young family. The original remodeled kitchen was good quality but not their style; our goal was to keep what worked and modernize what didn’t without breaking the bank. This was a successful cosmetic makeover. This loft was a super functional pied-a-terre that needed an update. The clients and I worked with much of the existing furnishings and art but refreshed the rest. The kitchen, living room and loft bedroom got new floors, paint, wall coverings, window treatments, and lighting, but the bathroom is the star of the show—it’s a real jewel box. With sprawling, 180-degree views of Puget Sound and surrounding Belltown, this loft was an easy sell for these Bay Area transplants. A new job in Seattle didn't leave a moment to spare. We needed to update the loft at breakneck speed without compromising quality. The master bath needed a to-the-studs remodel to replace the worn, builder-grade materials and finishes. Elsewhere, new surfaces, furnishings and accessories warmed up the look. We love the rich results. 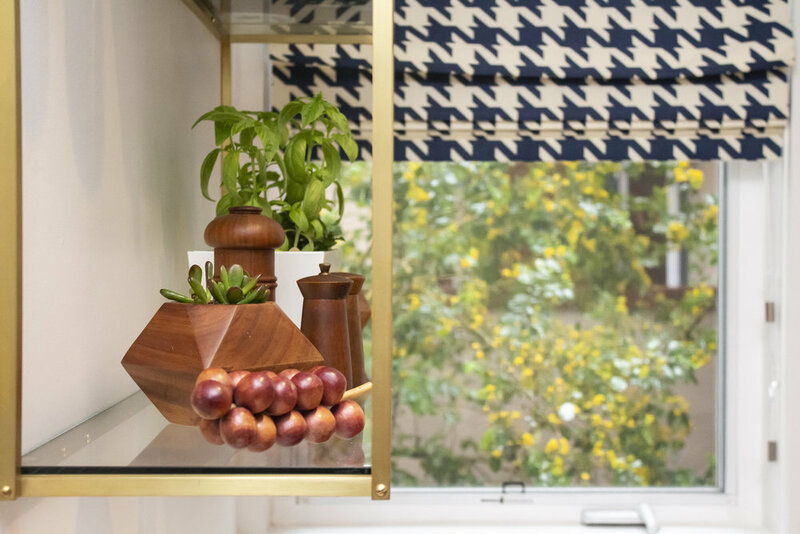 This client’s North Beach flat had lived a number of lives before we embarked on its refresh. Most recently, the unit was used as a vacation rental, and the furnishings were hard wearing and rental friendly. We transformed this petite pad into a unique space with personality and a thoughtful furniture plan. 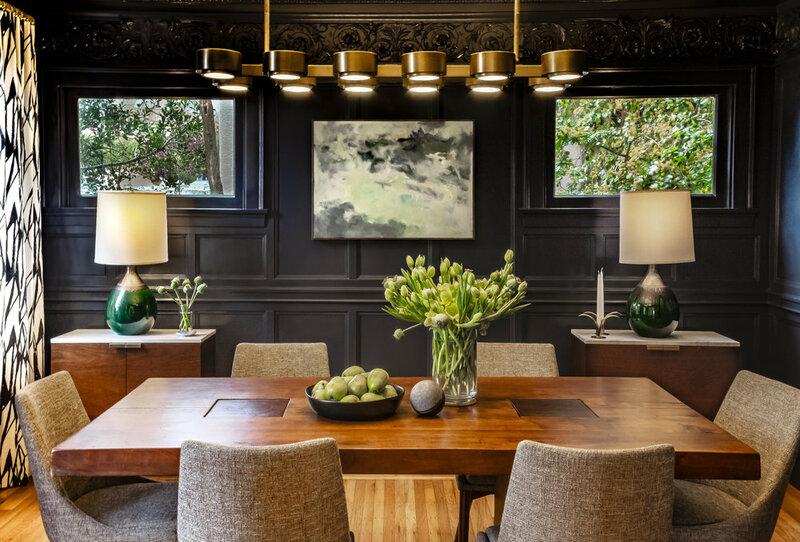 The new design created a beautiful backdrop for the owners’ extensive concert art collection. We’re big fans of this practical and whimsical new home. This project was time sensitive. The homeowners had a first baby on the way and a whole new home to furnish. This house, with it’s clean, neutral scheme and great vintage features, needed a little “decorating magic.” We quickly put together a design that was hard wearing but hip, while still respecting the traditional bones of the house. This 1964 ranch was modest but well built and beautifully maintained. The view of the lovely garden, grassy lawn, and mature citrus trees made the house feel a bit Palm Springs circa 1950. We used that vibe to turn this plain Jane into a cool, modernist family home.